The Marina Lagenstadt blends into the landscape of the natural park “Am Stettiner Haff” quite harmonically. The modern facility with 384 berths is located at the mouth of the Uecker in the “Stettiner Haff”. The entrance to the marina is located just 300 meters up the river right next to one of the most beautiful harbor entrances in Germany – the “Ueckerkopf”. The traditional Haffbad with its promenade and 800 meters of fine white sandy beach is only 250 meters away. The Stettiner Haff is an inner coastal-water in the estuary of the Oder and Peene. With all the tributaries it has an extension of 903 square kilometers and is much larger than the Bodensee. The east-west distance is 52 km (28.08 nm) with a north-south extent of 22 km (11.88 nm). The average depth of the lagoon are between three and ten meters. Our Marina is located near the Baltic Sea. The connection is given over the Peene river and the Achterwasser as well as the Kaiserfahrt next to Swinoujscie in Poland. Take advantage of the Marina Lagunenstadt as a starting point for short day trips, as a way point of your trip or for long trips. Take a trip around Usedom, Rügen and Hiddensee, visit the emerging Szczecin, travel to Swinoujscie or the island of Wolin. For longer trips, the island of Bornholm as well as the coasts of Denmark and Sweden are quite perfect. The season is from 1st of April to 31st of October. Your boat is sheltered and safe in our “three-star Marina” . The craning of the boats is possible on fixed dates for season start and end either by using a mobile crane or by utilizing our double-slip. 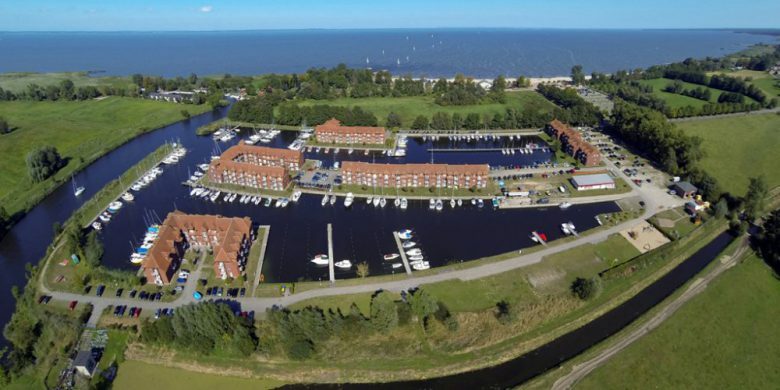 In addition to the service facilities of the port, the Lagunenstadt Ueckermünde AG offers apartments in its houses directly in the area of the Marina.